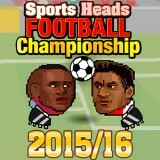 Here you are going to play as a real football player and try to do everything to become a champion! Use the arrow keys to move and space to shoot. So, everything is up to you right now. Choose your player and be ready to set the best record here. We know that you can do that.